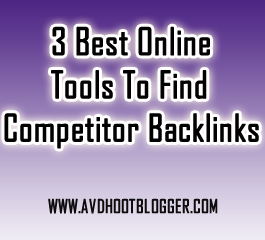 3 Online tools to find your competitors backlinks and get them for your blogger blog or website. Best and top online available tools for you. Backlinks are the most important part of any SEO strategy and also for the success and popularity of blog or website. The number of backlinks you have the more success you will get but remember quality will matter everywhere not the quantity. So here are some online tools that will help you to find backlinks of your competitors blog or website it simply means you will know the success formula of your competitors website. You will get a list of those websites where your competitor website or blog got a link or made a link through commenting . When you know the list of those websites from where your competitor got the link then you can also get the link or backlink from those websites or blogs. It will be beneficial for you, if he got backlinks through commenting then you can also write a good comment and can get a backlink from those websites. Along with you will know the list of those websites that are dofollow and like to have a comment in anchor text such blogging tips are good for your overall search engine optimization. So below are the top 10 websites that will find the backlinks of your competitor . Smallseotools is a good website with online tools to find the backlinks of your competition. It shows all the links where the blog or website is linked along with it also shows how many are then nofollow or dofollow. It shows 10 results per page. A very nice tool to get backlinks of your competitors website or blog. The best site with online tools to find backlinks, it shows the way how a website or blog links to another website. Means it will show the anchor text of your competitors website through which a website or blog is linked. It also shows the page authority and domain authority of the website where the website is connected. 1Such an awesome tool to find the backlinks, it is enriched with few awesome tools and features like it shows the url rank, number of backlinks, top pages, anchor text, type of top level domain. 2It also shows the type of backlinks means text, dofollow, nofollow, sitewide, redirect or images. 3It will show anchor phrases through which a website is connected or linked to another website, along with its shows referring pages, referring domains for anchor phrases. A must use tool. Online tools to create mobile apps of blogger blog. Description : 3 Online tools to find your competitors backlinks and get them for your blogger blog or website. Best and top online available tools for you.